SNIPER EFI Q-jet Base kit 4-injector system by HOLLEY i classic finish. Holley EFI hvor økonomien ikke løber løbsk. Are you tired of rebuilding the 50+ year old Rochester Quadrajet™ (Q-Jet) on your classic Chevrolet, GMC, Buick, Oldsmobile, or Pontiac? Introducing Sniper EFI Quadrajet™. The first bolt on spread bore electronic fuel injected throttle body system that does not require any additional adapters, sealing plates, or intake manifold swaps! 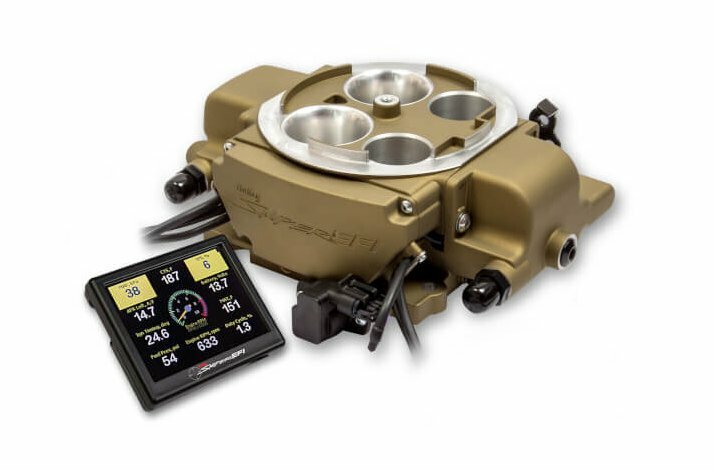 The Sniper EFI Rochester Quadrajet™ (Q-Jet) system retains the same great features as the 4150 Sniper EFI version such as; four 100lb/hr Injectors, built in timing control, a 3.5" full color touchscreen and much more! The throttle body will support up to 500 horsepower naturally aspirated. In addition to all of these great tried and true features, the Sniper EFI Rochester Quadrajet™ (Q-Jet) system will fit most stock air cleaners and offers multiple fuel inlet configurations that allow for a stock appearing installation! Designed to deliver the signature Rochester Roar at Wide Open Throttle! Supports up to 500hp with Four 100 Lb/Hr Injectors! High Resolution Full Color Touchscreen for Initial Setup, Tuning, and Gauge Displays. Simple Calibration Wizard (Answer a few questions about your engine and it creates the base map, then starts tuning on its own!) - NO laptop required! Self-tuning ECU means you don’t have to be a computer/tuning wiz to have EFI! The included Genuine Bosch LSU 4.9 Wideband Oxygen Sensor provides realtime Fuel Map Learn! OEM Style Throttle Position Senser (TPS)/ and Idle Air Control (IAC) for years of dependable service. Læs instruktion og installationsvejledning grundigt inden køb/montering. Vær speciel obs på montering af pumpe og returløb. En "normal" installation vil typisk tage 6-8 timer.